In April 1972, Apollo 16 was the tenth manned flight in the Apollo program, leaving the cradle of Planet Earth for another world. Onboard that spacecraft, the Lunar Module Orion undocked from the Command Module Casper for a powered descent and landed in the Descartes Highlands for the fifth mission to land on the surface of the Moon. 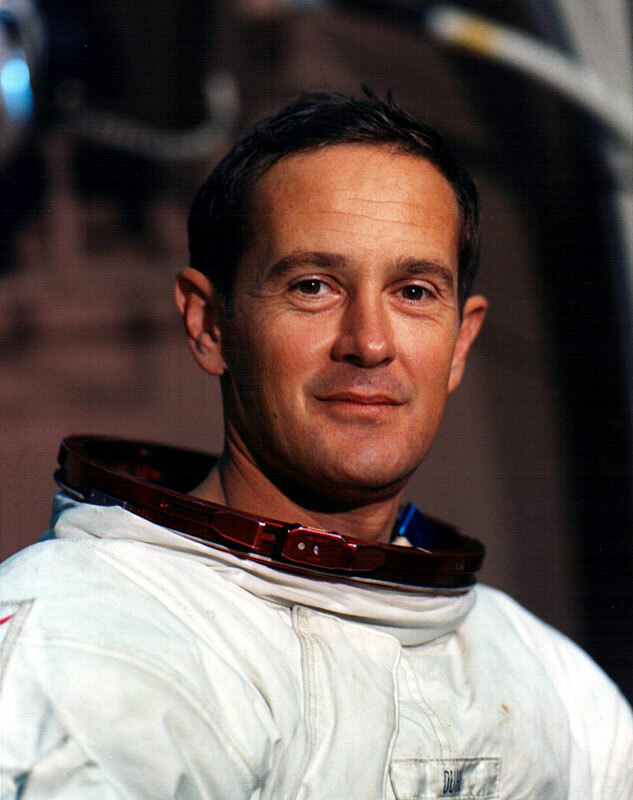 Charlie Duke was the tenth man to step foot on the Moon. 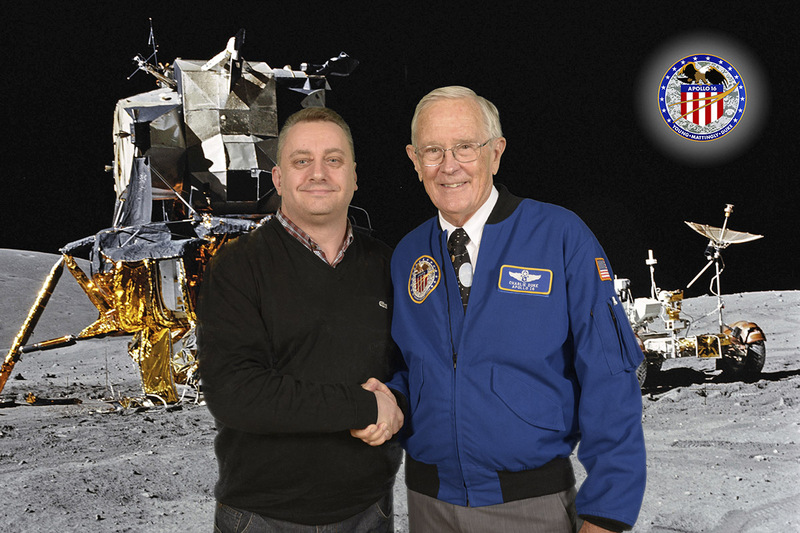 Today I’ve met the Moonwalker Charlie Duke. Roger, Twan… Tranquility. We copy you on the ground. You got a bunch of guys about to turn blue. We’re breathing again. Thanks a lot. Duke then served as backup lunar module pilot on Apollo 13 before becoming the tenth man on the moon with Apollo 16. Today he’s sharing some of his memories with us from his time in Mission Control during Apollo 11 first lunar landing and his time on the lunar surface. It’s time to get my space face on for a photo and meet the moonwalker Charlie Duke. Some of you might wonder why I decided to become an astronaut. It was actually in my 20s, when I was a young boy growing up in South Carolina, I didn’t go out into the back yard and say Momma, one day I’m going to walk on the moon. My Momma would have sent me to the psychiatric hospital, there were no Moonwalkers in those days, no astronauts, no spacecraft. My father served in WW2 as a Navy officer in the South Pacific. When I was in high school, I decided I wanted to serve my country so I got selected to the naval academy and started my midshipman training in 1953. When I got to the naval academy, I fell in love with airplanes. They put me on some cruises while I was there and they also gave me some airplane rides and that was the real adventure sitting in a seaplane with an open cockpit, two wings, a pre WW2 airplane and two navy seaman sitting out there with a big crank to start the engine. Back then there wasn’t an air force academy so they would allow naval midshipmen to go into the Air Force or the Navy, we could choose. It was a big debate with me but the decision was decided by a doctor at the naval academy who told me “Midshipman Duke, you have astigmatism in your right eye, you don’t qualify for Naval aviation but the Air Force will take you.” So I decided to go into the Air Force and I don’t know how many hundreds of physicals I’ve had since that time but nobody has ever seen astigmatism in my right eye. When I was in flight school, Sputnik was launched in 1957 and 3 years later, the first cosmonauts and astronauts were selected. In 1961, I was a young fighter pilot at Ramstein in Germany when Yuri Gagarin was launched and then Alan Shepard went up and two weeks later, Kennedy announced we were going to the moon, land on the moon, and return safely from the moon within the decade. We’d had 15 minutes in space. I’m sure the older ones i here can remember rocketry back in those days 5, 4, 3 2, 1, blow up, or out of control if it did lift off. Jim Lovell said that rocketry and being an astronaut wasn’t the greatest longevity you could expect. I laughed at him but the most amazing thing about this whole thing as I look back between that time and Apollo 11 was 8 years and 2 months. We did it, we landed on the moon in 1969 with Neil Armstrong and Buzz Aldrin and I had the privilege of being in Mission Control talking to them as CapCom when they landed on the moon. It was an amazing event for me to be there during this historic moment and feel the tension that was overwhelming the pride, were we going to make it, we did, and then the pride welled up. Everybody was so thankful when Neil successfully landed this machine with minimal fuel. I had been on the call, Eagle 30 seconds, and the next call was going to be Eagle abort, and had we gotten to that 30 second point and I call Eagle abort, I’m sure there have been “say again Houston.” He was going to land despite the fuel problem. I got back to MIT in 1962, doing a graduate degree in aeronautics, my thesis was on Apollo guidance and navigation system which MIT had the contract to build. So I met some astronauts, they were so enthusiastic that I stated thinking how I could get that job. I knew I had to get back to flying, I didn’t want to make a living as an engineer, it’s a good background academically. I applied for Test Pilot School at Edwards, Dot and I had been married the day before. We started out in our little compact car, got to Edwards Air Force base in the Mojave desert, back then it wasn’t a paradise but it was like a fighter pilots heaven, all those airplanes for me to fly, Dorothy cried for about two months. It was a desert. I graduated in August 1965 and the very next month I was reading an article in the paper that NASA had another astronaut selection, please apply. Almost a first page advertisement. I applied, my boss, a guy named Chuck Yeager, a well known test pilot, I was working for him, he was very enthusiastic so a number of us applied. 12 of us graduated in August 1965 and 4 of us were selected as astronauts, 3 of us made it to the moon; Al Worden, Stu Roosa and myself. Hank Hartsfield was the 4th guy and had a very successful career as a Shuttle pilot. Things were really progressing until we had a fire in January 1967, it killed Ed White, Gus Grissom and Roger Chaffee. Apollo was dead in the water, we weren’t going to make it by the end of the decade. We started working really hard and in October 1968 Apollo 7 flew with Wally Schirra, Don Eisele and Walt Cunningham,a successful flight and then the most dangerous flight in all of Apollo, was Apollo 8. The first time we had humans onboard Saturn 5, first time we’d gone to the moon and with no back ups. If that service module engine didn’t work to get them in orbit and to get them home, they’d be trapped and no rescue. 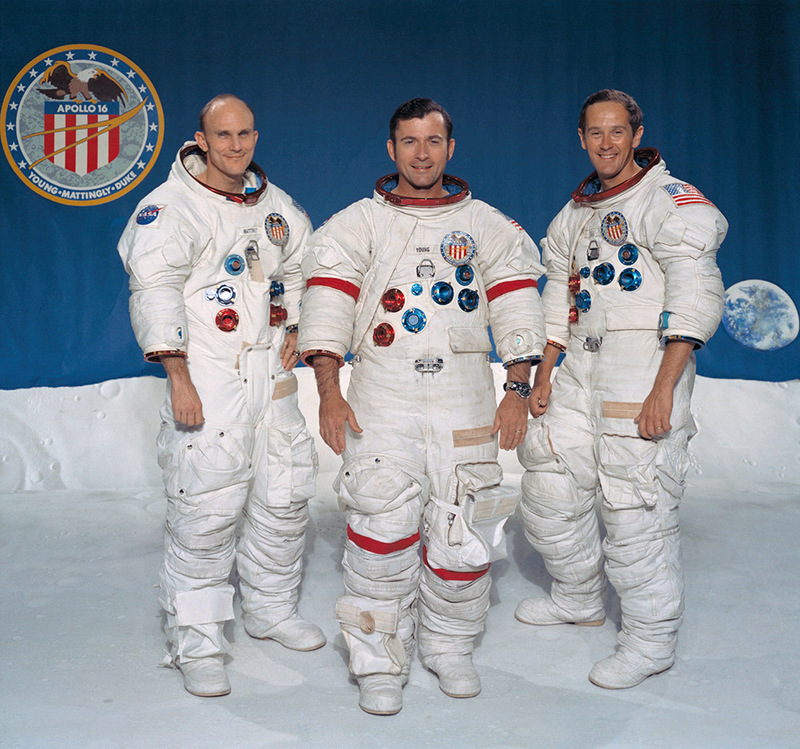 Borman , Lovell and Anders were ready to go and take the risk and sure enough, you may remember Christmas Eve 1968 with the first views of Earthrise and the reading from the scriptures, a very moving event for me. That was the beginning of the first missions to the moon and a lot of people, even today tell e we faked it. I always say to them if we faked it why did we fake it 9 times? 6 of them were successful landings, unfortunately Apollo 13 was unsuccessful but in a way it was successful because we at least got them back alive. I was support crew on Apollo 10 and was in Mission Control with Gene Kranz, I was the CapCom when they did that simulated lunar descent, they actually started their descent but then aborted and came back up, didn’t go for landing. As Gene Cernan said “Charlie we are really down here among them” which meant they were really low, less than 50, 000 feet skimming across the moon. Mission Control helped save Apollo 11, helped Apollo 10, saved our landing on Apollo 16 and certainly rescued Apollo 13. 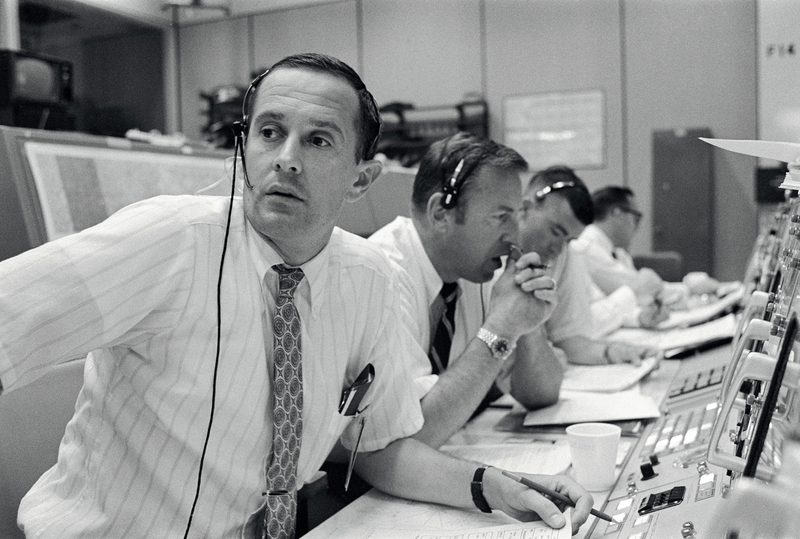 Mission Control was the unsung hero of Apollo, without Mission Control, some would be dead. I was very privileged to be there for Apollo 10 and Apollo 11, and for Apollo 13 I was back up with John Young and Jack Swigert. You probably know the story, a week before the launch, I catch the measles, if you can see a stunned NASA flight surgeon, I was really sick, they looked at me and gave me blood tests and said I had the measles, “How did you get the measles?” Kids have the measles, I got the measles from my 3 years old son and his friend. Ken Mattingly hadn’t had the measles, the doctors kicked him off and was replaced by Jack Swigert, so Mattingly came back on our crew. If you did see Apollo 13, the movie that Tom Hanks made that made Jim Lovell famous, and also Gene Kranz, we got o see that movie at a very special screening, we were the first 200, all of us flight controllers and Apollo astronauts, and Tom Hanks never looking so nervous, the first time people are going to see this movie, were the guys and girls that were in it, they said we want everybody to remember that this is a movie not a documentary. I thought it was really good and even though we knew how it was going to turn out, we were sitting on the edge of our seats! They captured the chronology of it all and only 2 1/2 hours to fit it all in. We gave them a standing ovation for that film. 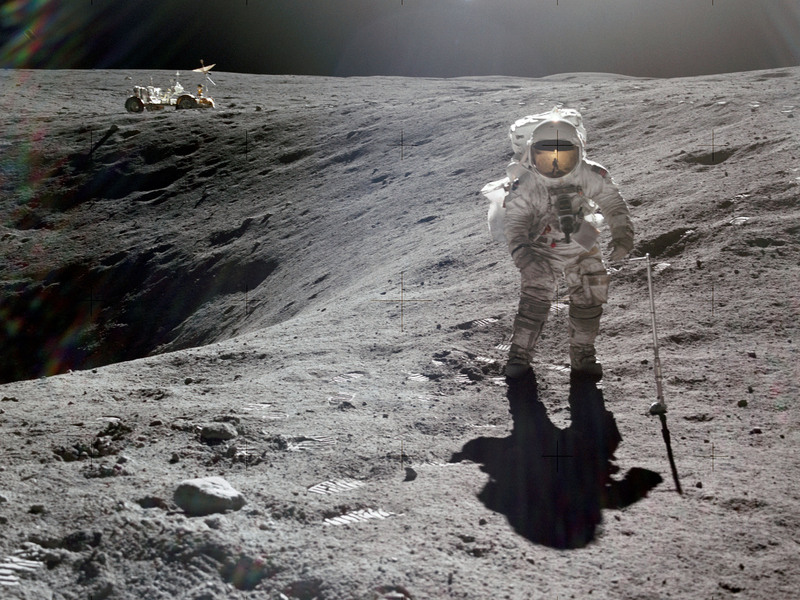 Then John Young and I started training with TK Mattingly, you know he never once mentioned the measles….we made a great team, unfortunately our flight kept getting delayed but as a result John and I got to ride a lunar rover on an extended mission ‘J’ mission spending 3 days on the moon. Training as an astronaut, we made it look glamorous, dhow up and wave to the crowd and launch to fame and fortune but nobody sees the 1000 hours in a simulator, 500 hours staggering around in the hot Florida sun learning how to do all these experiments that we had on the moon to do, drive the rover and geology. We had a geology field trip at least once a month where we would go out and study rocks. The whole purpose was to pick up rocks, we were fighter pilots, we got the equivalent of a masters degree in geology. When we got to the moon, the rocks we were supposed to be finding were not the rocks we were finding. Lesson number 1 is really important in geology – pick up 1 of every colour, and on the moon we had grey ones, white ones and black ones, mostly grey ones. They were expecting us to find volcanic rock so when we started describing these rocks we were picking up, we found out later on that Mission Control were shaking their heads, wasting 6 years of training on these guys, they don’t know what they’re seeing! But then they got really excited because we were insistent that these rocks were this and we were right. These rocks were very unique moon rocks. Spaceflight is not an avenue to fame and fortune, fame is being recognised, I hardly ever got on an airplane and have people say I know you, you walked on the moon. Which is really fortunate because you can have a little private time. Unfortunately we didn’t make a million dollars going to the moon. I was a Lt Colonel and I got paid the same as every other Lt Col but NASA terminology and Air Force terminology, a trip to the moon is a temporary duty, hopefully! So they pay you per day for every day you are on temporary duty and back then, the stipend was $25 a day. In an 11 day trip to the moon that’s $275, it might buy me a new golf bag or something. So I filled out a travel voucher, basically it said Houston-Kennedy-Kennedy-Moon-Moon-Kennedy-Kennedy-Houston. the actual flight was 11 days and I got my travel voucher back, it said that for those 11 days government meals and quarters were furnished and they deducted that part. We all argued, how about mileage? For the moon flight I got $13.75. I would have paid them my whole year salary for that adventure. We launched on schedule on April 19 1972, if you look into the hatch on the Apollo spacecraft, John Young was on the left in the Commanders seat, the centre seat was Ken Mattingly Command Module Pilot and I was in the right seat. John gets in first and strap him in, I get in, and then Mattingly gets in, they close the hatch, Günter Wendt waves and then leaves, they don’t want to be around when this thing goes off. We were ready to go, if anybody thinks you have anxiety at lift off, the only anxiety you have is please launch, get going I’m ready. I’ve done more training, I want to launch this machine and be on my way. If it did launch, a thousand things could happen that could go wrong, the rocket could fail and cancel the programme, break your leg and then you’re out of business. The Apollo window had 4 hours to launch, after that the moon had rotated out from your landing site. Plays video: Here’s what we looked like 45 years ago, grey hair now, Mattingly probably still looks the same, he didn’t have any hair to lose, John’s slowed down a little bit, I think Mattingly and I would still qualify for moon flight but NASA said don’t call us we’ll call you, I’m not expecting any call. We were at the top of the Saturn, this vehicle is 363 feet tall, 33 feet diameter and weighed 3 million kg. The only thing I remember at lift off was the vibration, noise was incidental but the vibration was shaking like crazy, you can’t see outside, I didn’t have the flight instruments on my side, I was a little concerned, was this thing really going right? It was go, I got really excited, I could feel my heart pounding. So when we got back I asked the flight surgeon what was my heartbeat during lift off. He said you were really excited, your heartbeat was 144. How about John, what was his? His was 70. John was the cool soul of the whole flight and a great commander, we had a great time training together, became really close and still till this day. We circles the Earth 1 1/2 times, everything checked out, ignited the 3rd stage to escape velocity which is 25000 mph and we were on our way to the moon. Apollo took 3 days to get to the moon, 72 hours. the reason for that was the fuel budget we had in the Command Module, so much fuel to get into orbit, to maneuver, get out of orbit. You can go directly to to the moon in 12 hours but you’ll be so fast when you get there you wouldn’t have enough fuel to slow down. So you are shot way out in front, allow Earth gravity to slow you down and end up having a 72 hour trip. When we got there we were still travelling too fast but had enough fuel to slow down into orbit and enough fuel to get back. On the way out we did a lot of experiments, various light flash experiments, Mattingly had some Command Module stuff to do. We got there on schedule in lunar orbit and as we came around from the back side, the first major impression I had was as we came in to lunar orbit in darkness on the dark side, the engine shut down, no contact with Earth, the computer says in orbit, good orbit. We re-orientated the spacecraft so that when we came around, you had sunlight in the back, sunrise i Earth orbit is very dramatic, the moon has no atmosphere, you go into sunlight and bang there it is, start seeing long shadows that get shorter as you go around. I remember seeing 2001: A Space Odyssey with that dramatic music, that’s what I imagined as I saw Earthrise. We were glued to the window, the Earth out there in the blackness of space 1/2 Earth , could see the 2 polar ice caps, white and blue in between, I don’t remember seeing any brown, just oceans and cloud. Houston confirmed out orbit, that started out 5 days at the moon. 1 day in orbit for us, 3 days on the moon and a day in orbit afterwards. Our view of Earth was like a jewel. Everywhere else you looked, except the moon and the sun was black. Stars, unlike Hollywood, you don’t see any, the sun is always shining, so you just see this blackness of space, very very vivid. We had the southern most landing, if you consider Apollo 11, we were 8000 feet above Apollo 11, like being in the tops of the mountains. Everybody else landed in the Mare (lunar sea), we were the only mission that was scheduled to be up the mountains of the moon, the lunar highlands. 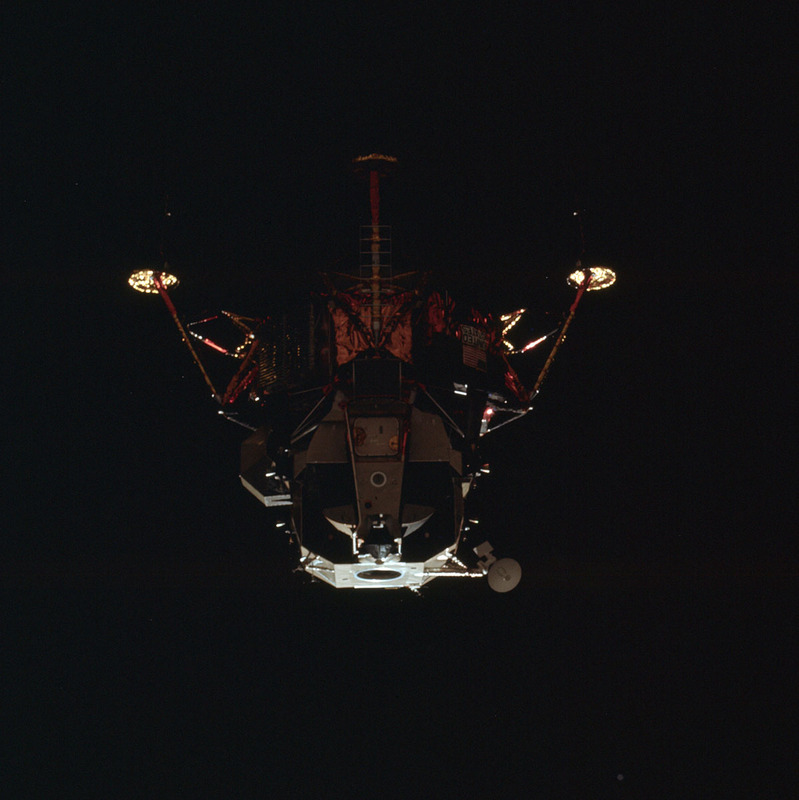 Our Lunar Module (LM), upside down, we didn’t land that way, it spoil your whole day going this way, we separated in orbit and this is the picture that Mattingly took right after we separated. We were in a 60 mile by 8 mile orbit, we were 8 hours in the LM before we started our descent. but 1 hour before we were scheduled to start our descent on the back side of the moon, Mattingly had to start the Service Module (SM) propulsion system engine to change his orbit to a 60 by 60 mile orbit. That was because if we had to abort coming back up, he would be in position where we could make a rendezvous. 5 minutes before he was ready to do that burn, he said that there was something wrong with the engine. That gets your attention, that’s your ride home. He said it was shaking to pieces, big vibrations. John said don’t worry. When John says don’t worry, I though that was the end of our chance of landing. We had a mission rule that without that engine back up, we had two controls on that engine, we would abort and we were going to come home and use the LM engine, similar to Apollo 13. We went around the far side, Mission Control was very concerned, and I think it was the second time around, they said they’d figured out whats wrong, couldn’t fix it but had a workaround to have a secondary system. I won’t explain the details of that but what a relief! My heart was in the bottom of my boots, if you can imagine that in zero gravity. We got so excited when they gave us the go for landing. The first looking out of John’s window was to the south, a place we called Stone Mountain. John made a tremendous perfect landing as I talked him down. From about 500 feet he was fully manual with the control, I gave him landing destination from the computer and he’s picking out a spot so when he gets down had to maneuver, the problem was that with the maps as we studied our landing spot, the photographs in our landing area were only 15 metres resolution, 45 feet, there were a lot of craters up there less than 45 feet that will swallow a lunar module. We started seeing all these craters as we maneuvered on. Fortunately he picked a spot that was dead level so we could work very accurately on the moon. Looking out to the west was the open part of our valley, we landed on the Cayley Plains, with a horizon far beyond our capability of going in the rover. the rover would drive all the way to the horizon, it had enough electrical power but if it broke down out there, you had to walk back. We figured out the maximum we could walk back was about 4 miles. 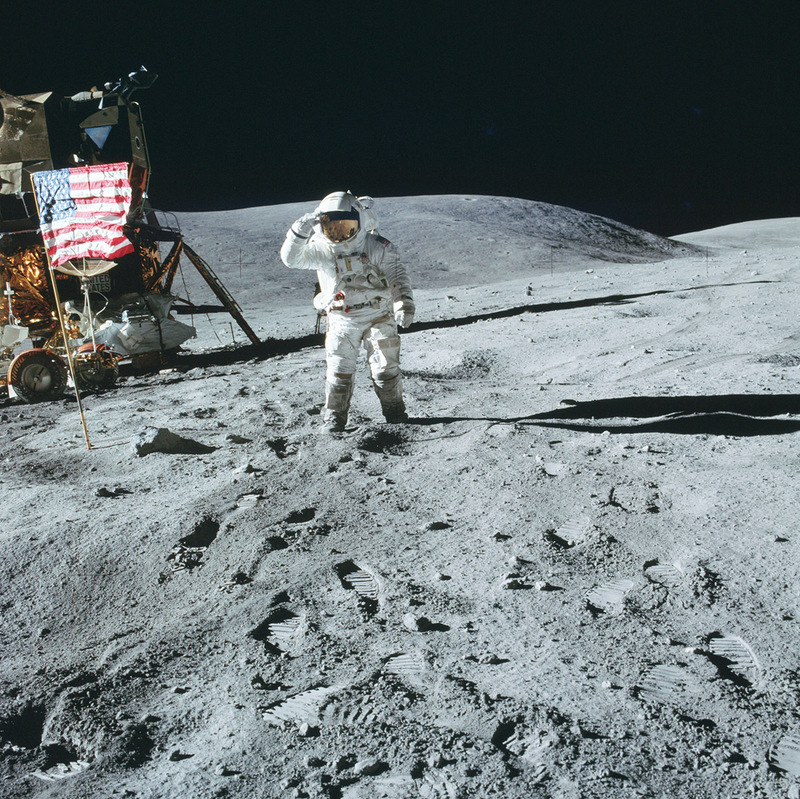 My famous salute picture you can see the lunar module, the ladder and the car and the flag. A lot of people who don’t believe we went to the moon, say “look at that, the flag is blowing in the breeze, there’s no wind on the moon, NASA was so stupid they forgot to get the flag still.” Well the flag is not blowing in the wind, its held out by a curtain rod and its wrinkled because it had been vacuum packed fro 6 months and I couldn’t get the wrinkles out of it so we just left it that way. If you look at a picture I took 72 hours later, it’s almost the same way. There’s no question we actually landed on the moon. People ask what did the Earth look like from the moon? When you stand on the moon and you look down, you’re looking at your feet, if you want to see the Earth you have to look up. Where we landed, the Earth was directly overhead, to look up you’re looking at the top of your helmet. the only time I really saw the Earth was looking through the periscope or when I fell over backwards, very rarely did you see it. The car was actually stowed over the other side of the ladder. This was a 10 foot car, they only had a 5 foot place to put it, 1 10 foot car folded up, bolted to the outside of the spacecraft and covered with Mylar gold material. 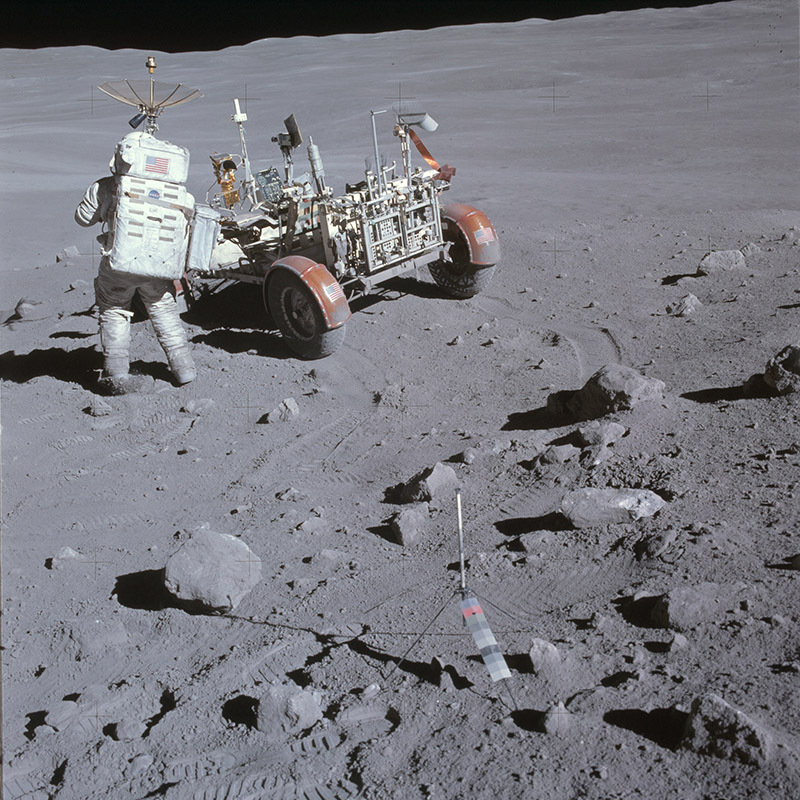 When we got there, John backed out, pulled a handle and released the top of the lunar rover. I got out and one of the first thing s we did was to get the car off. we had these cables that we started pulling, tuning a jack screw and when it got to about 45 degrees, all the pins pulled out and the thing flopped open. It was amazing, like landing gear on an airplane. It jacked down till the back wheels were on the surface, we went to the front and laid it down. John was going to drive it but he didn’t want to back it out so we picked it up and walked away. If you didn’t like your parking place on the moon, just pick up your car and choose another one. At the slope of Plum crater, you’ll notice our footprints go around, we gave this crater a wide berth ‘cos if you slipped in to that there was no rescue. You can see the rover and black rock and to the right of that is another black area, it was actually a rock, a pretty big rock so, you can see it on You Tube now, it was actually on the flank, the back end towards this crater. The rock was so big that I couldn’t get my hand on it so I rolled it with my leg, the biggest rock I think that anybody collected up there. We argued with them asking them if they really wanted a rock this big, so we did, not because we wanted to but because they asked us to. The moon is dusty, mostly grey, and the dust is very fine like powder, so everywhere you walked you left footprints. Mostly the footprints were maybe 2cm deep. The last EVA we made was a place called North Ray Crater and stood on the rim of that crater up there was like walking on this stage, no dust, mostly the areas we worked, the dust, you could drill down into it, leave a trench with your shovel and it was still loose underneath. On the flank of Stone Mountain, we drove out as far as steep slope, about 300 metres above the Cayley Plain and looked out across this broad expanse, really beautiful, and as we came off this mountain, I think we set the moon speed record. That car was bouncing like crazy, we didn’t know exactly how fast we were going but knew we were over 11 mph because that’s as far as the speedometer went. we claimed the moon speed record and had a big fight with Apollo 17 and ended up sharing the record in Ripley’s Believe it or Not. 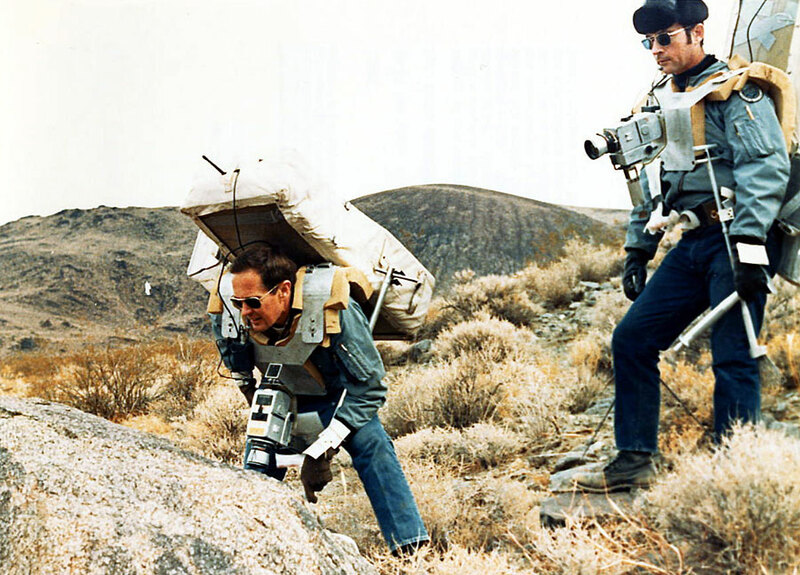 We had a good time on the moon, John was a great guy with a great sense of humour, it was really an exiting time.At North ray Crater with Smoky mountain at the back, I said to John on the EVA to go sample a rock in the background, he said it was too far away, I talked him into it, so we started jogging, we called it House Rock, it was about 45 feet high and about 80-90 feet wide. I’m looking up at this big rock and I’ve got this little hammer in my hand, if you listen to the transcript, we were really impressed. I whacked it and a piece fell off about the size of a grapefruit. We were hoping to get to smoky mountain but it was beyond our range. This is the family of astronaut Charlie Duke from planet Earth who landed on the moon on April 20, 1972. We all signed it, I dropped it on the moon and took picture of it. 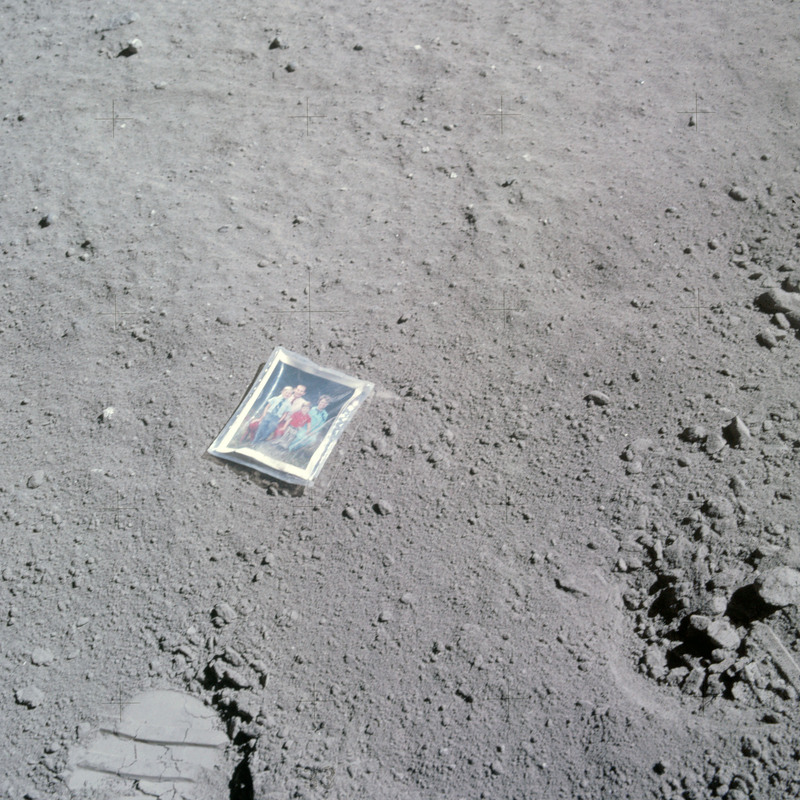 People want to know if the picture is still there it is still there but unrecognisable, 45 years of cosmic radiation, temperature variations on the moon and people in photography say the photo will be faded out, so would the flag, it would probably just be white. You can see in the LRO photographs, the descent stage and experiment packages, I’ve not been able to make out the flag yet. This is all we brought back (the LM) and we left that in lunar orbit and then home again to splashdown in the pacific ocean. John and I had a great time on the moon. At lift off, you see the white stuff that’s falling off is ice, a couple of tons of ice on the side of the vehicle because the fuel was so cold. by the time we had cleared the tower, all the ice was gone. This launchpad is now is used by Space X to launch the Dragon. On our mission the first stage lasted for 2 minutes and 41 seconds and consumed 4 1/2 million lbs of fuel, well over half our weight of our vehicle. All of this time we are vibrating, slowly accelerating as we got the maximum 4.5 x gravity pushing back in our seats. We still couldn’t see out at this point. When the first stage shuts down, its like an explosion, go from 4.4 Gs to 0 and want to slammed forward, everybody stiff-armed against the instrument panel, strapped in tight. You can imagine a 33 feet diameter aluminium structure, you can imagine the power of the separation charge that separates all of that aluminium. Mattingly was a real exercise guy, he’s staying in shape, John and I conserving our energy for the moonwalks. The crowdedness of the SM, it was 300 cubic feet, after the couches etc, each astronaut had 68 cubic feet of space. Its impossible to eat something still, most foodbags were dehydrated. Going down to the moon we were a little north and a little west, so we started down and from about 100 feet we came down vertically like a helicopter, the lines below the landing pad were electrical probes and when they hit the moon, they turn the light on that say contact and you shut the engine and you drop in. The second you stop the engine, the dust stops, it was gone. Very vivid black shadows. With John;s first steps on the moon, I had a camera up in the window, no voice was recorded, that was recorded from Mission Control. We had film cameras back then, I cleaned this film magazine off, it had a lot of dust on it so I started blowing, it didn’t work. I felt like an idiot, I didn’t tell anybody at that point. We got the car out and put the TV on, the TV was controlled by an engineer in Mission Control. We were outside and I got John to give a big navy salute, you can seeing jumping a foot or so. His balance was outstanding, I was too nervous to try that. My most embarrassing moment, between my arms is a 10 million dollar experiments package, on the left a radioactive power source. As I jog along, everything is going well and then it falls off (Duke falls over on video). I had a quick look to see if they say me on the TV, they did and I had to fess up. Fortunately it wasn’t damaged at all. In the video with John running with the magnetometer that was on the back of the rover, notice as he runs, how he kicks up the dust and what happens to the dust, it just goes out ad lands. There is so much evidence we landed on the moon, these guys who think it was all a hoax, they just don’t see these pictures. I’m drilling a hole on the moon, I had 3 of those to do with a handheld battery powered drill and they were all 10 feet deep. I got out the car and got the camera and was taking picture we called the Grand Prix. Notice how rough the surface is and how the car bounced along. from onboard you can see how bouncy it is and how rough the surface was. The penetrometer, when I pushed it went all the way in, it surprised me, now I had to get up, I don’t know what John was doing but I decided to get up myself, took me about 3 push ups. The lunar soil is really fine and what started out as white suits ended up grey. We fell down a lot and the dust got all over us, we lost one of the fenders on the rover, the dust pouring down over us. Normally we would collect rocks together so that we could be more efficient. But sometimes when John or I was busy, we would do it individually. Here I am trying to get this rock, I’m determined, I caught it this time but then dropped the bag. So we had plenty of bags. On EVA 3 you see Smoky Mountain in the background, bigger than Stone Mountain but just too far away. On the moon Olympics we set the high jump record. But here I go, over backwards. That was really scary, if that backpack breaks, I’m dead. All of your electrical power, all your respirator regulators, your water, everything was in that backpack. i realised I was in trouble so I managed to roll right, broke my fall on the right side, bounced on to my back. John looked down and said “You OK?” He didn’t know ‘cos you couldn’t see inside, i could have been dead. He helped me up and that ended the moon Olympics by the way. No more events. Mission Control was very upset. We left the car on the moon. 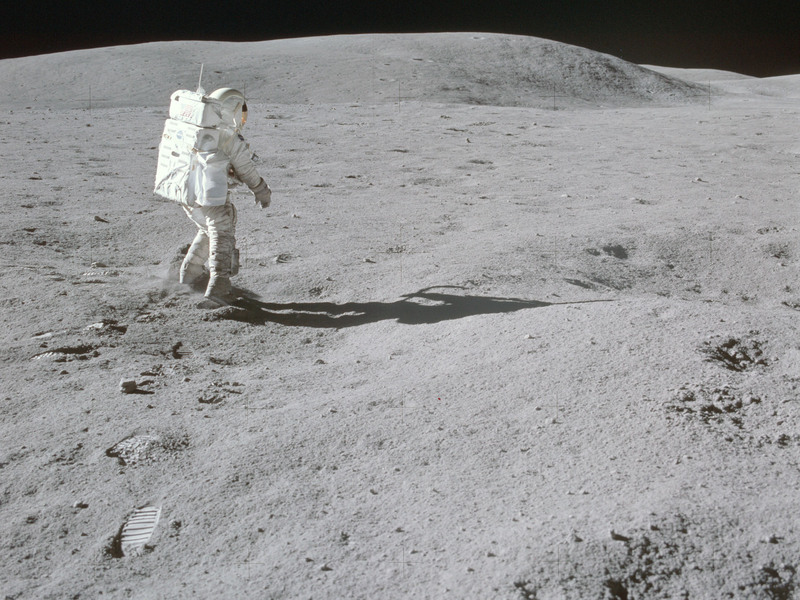 There are 3 cars on the moon from Apollo 15, 16 and 17. On re-entry, its like being inside of a big furnace, all this fire and heat on the outside, you were decelerating as you came in at about 7.5 g. Apollo could fly like an airplane, not really good but it would fly, because it had lift vector and you could fly it to hit the landing spot. At about 100, 000 feet above the Earth, we would free-fall and at 23000 feet, drogue chutes came out and all they had to was make sure the parachutes were up and the heat-shield was down, that way you weren’t going to get tangled up. At 10000 feet, the main chutes come out and you are home free. This is really a beautiful sight. We were right on track, could see the helicopter. 13000 lbs of spacecraft was all that remained of a 6.5 million lbs vehicle and inside with us was about 213 lbs of moon rocks. Mission complete. But when we landed, one parachute remained inflated, we flipped over and were upside down, the hatch was under water, we looked out and all you could see was water. We had an airbag system that we turned on to start pumping up the airbags that were underwater so that flipped us back over so that hatch was above water and we were ready to get out. On the way home we had a spacewalk, Mattingly was outside working, I was his lifeguard. We were connected to the spacecraft by lanyards, so he gets out going hand over hand to the back end of the SM. I just lock my feet in the side of the hatch, just standing there making sure he doesn’t get all tangled up, I look over the hatch and there was Earth about 180,000 miles away, a little thin sliver. I rolled around and saw the moon, 50,000 miles away, almost full, it was gigantic. I could vividly see that giant moon, the sun was up and everywhere else was just blackness. On the second day of out mission, Mattingly was getting cleaned up, we tried to stay as neat and as clean as possible, but 3 guts in 300 cubic feet for 11 days with no showers was a little spicy. To do that, he stowed his watch and ring in a little pouch on the side of the spacecraft, so when he started getting dressed again, everything was there except for his wedding ring. It had floated out of this little pocket and it was somewhere in the spacecraft. We looked and we couldn’t find it. 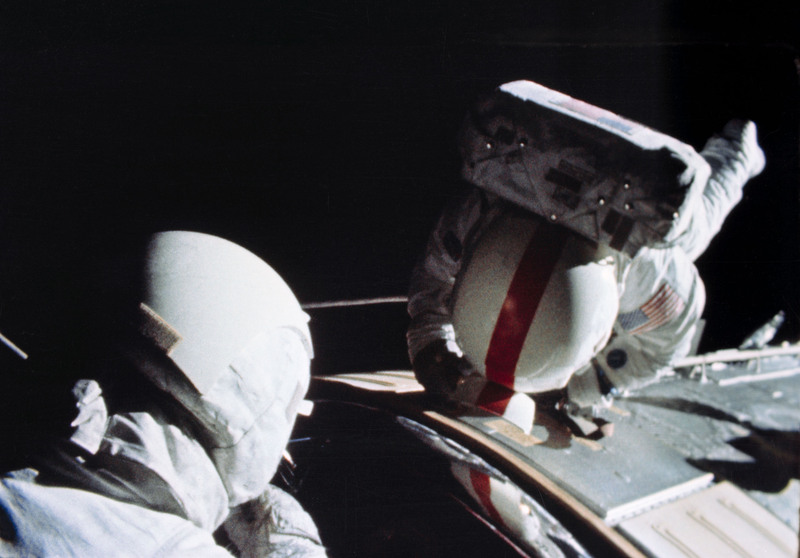 Ken Mattingly (red stripe) during his EVA on Apollo 16. 3 days later, we come back, he’s still looking for this ring. During this EVA, we were travelling through space at 3000 mph, no sensation of motion. I get outside, Mattingly is through with retrieval experiment, the hatch is open, shimmied out on a 10 foot pole, a little biological experiment he was activating. His back was to me and he was just shining in the sun, I was back in the lower equipment bay, just watching all this, almost mesmerising. I saw this glint of gold and I looked over, his wedding ring slowly floating out the hatch, I reach for it and I missed it, I’m wedged in and by the time Id have broken loose it would have floated out the hatch, lost in space. Only velocity that was different from everything else was that little velocity that was taking it out and it was going right towards him. I started to say Ken, Ken, there’s your wedding ring but he busy in this experiment with Mission Control so I didn’t interfere, but the ring hit him on the back of the head, he couldn’t feel it. When it hit, I was amazed, it did a 190 degree bounce and I waited and waited and went right back through the centre of the hatch right in front of me and I grabbed it. I put it on the little finger of my glove, so when he came back in in I said I got it for you. We didn’t go into quarantine because there weren’t any bugs on the moon. We got back out, took a shower and by the time all that had happened they got the Command Module on board the ship. We had checklists and stuff, we got back it, but you cannot describe what the inside of a Command Module’s filth smells like after 11 days and 3 guys and no shower. Since that time I have never been back inside our Command Module. Apollo was 9 times to the moon, 6 successful landings, a tremendous event in human history and what a privilege it was for me to be able to participate in so many of those missions. I was involved in 5 of those that went to the moon. You probably realise that there are only 6 of us left alive, I turn 82 next month, by 4 months I’m the youngest, I don’t how long we’re going to get to be around, hopefully for the next moon flight launches I’ll be able to see that, who knows. Like I said I’m not going to get a chance, some of the young ones here, the next generation might return to the moon and I believe the human spirit is going to take us to Mars. There is a lot of conjecture about whether a human body immune system, radiation for a full year in deep space can survive. I think we’ll figure it out and sooner or late we will send humans. Buzz Aldrin is ready to go now, Buzz is 87, he wants to go on a one way trip and colonise Mars. I couldn’t think of anything worse or boring. Always in a spacesuit, in some habitation module, look out and there is this reddish planet. I love Earth. It was a bold step for John F. Kennedy to say we were going to go to the moon. Everybody that went loved the last part of that statement,we are going to go to the moon, land on the moon and going to return safely. Nobody wanted a one way trip. Charlie Duke is a fantastic speaker. Enthusiastic, humble, proud and definitely made of the right stuff. Blackpool ….. The Last Resort?